There has been a lot of land development in Wyoming County in the past year, leading to the highest amount of application fees collected since 2011 by the county’s Planning Commission. Nonetheless, county planner Lynnelle Farber told the county commissioners at their public meeting on Nov. 27 that those fees have not been adjusted since the last Subdivision and Land Ordinance (SALDO) was approved in 2013. Farber asked for an average increase in application fees, municipal and engineer review fees, and subdivision fees of about 25 per cent, an amount she maintains is consistent with neighboring counties of similar size and population. 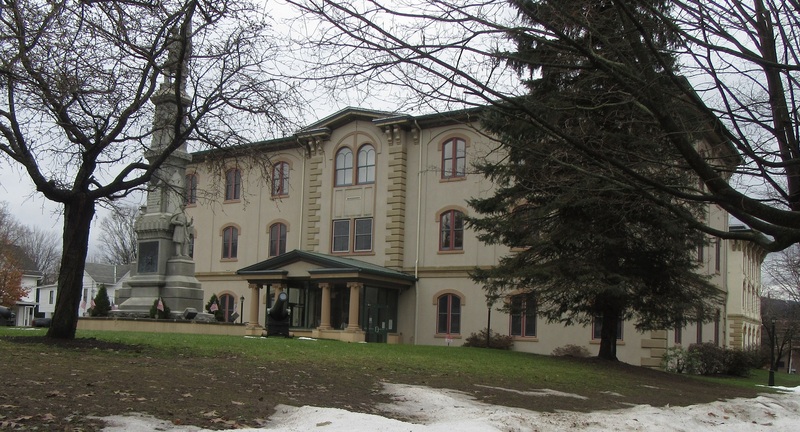 The commissioners unanimously approved the request, and the increases will go into effect at the first of the new year. On the heels of an appeal by a Falls Township couple at the previous commissioners meeting to avoid any changes in the polling places used by voters as had been proposed prior to the general elections in November, the commissioners agreed on Tuesday that the Falls precincts should be consolidated. The county deals with a continual decrease in poll workers with every election cycle, and Kellett was also trying to incorporate a state mandate that voters must cast their ballots within their respective municipalities. “Consolidation has to begin somewhere,” commissioner Judy Mead said of Kellett’s revamped request. The new proposal would have all Falls Township voters going to the Assembly of God Church and all Overfield Township voters casting their ballots at the Lake Winola United Methodist Church. UMC members and Falls Township residents Bob and Sue Thompson told the commissioners on Nov. 13 that dinners sold on election days are the bread and butter of the ladies auxiliary there. They were hoping for no changes. Kellett pointed out that there are more voters in Overfield Township, where residents had formerly voted at the fire hall. “They’re getting a bigger precinct,” said Kellett in reference of the potential for the UMC to sell even more dinners. “We’re trying to accommodate everyone,” said commissioner Tom Henry. According to Kellett (below, right), now that the petition has the commissioners’ blessing, it will go through the solicitor and on to the judge. A legal ad will be posted in local papers as to when the judge will hold a public hearing on the matter. Chief clerk Bill Gaylord (above, left) indicated that he has been working closely with PennDOT and the county’s engineers to recoup as much of the $226,962 in gas tax funds as possible. “It looks like we’re going to get all or most of it back,” Henry agreed. The commissioners received a belated birthday card from the Wyoming County BAR Association and a $175 check recognizing the 175th birthday of the courthouse, which was celebrated in the fall. The members of the association asked that it be deposited in the capital improvements fund for projects in the two court rooms. 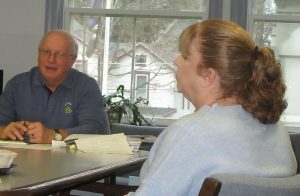 Henry noted a recent visit to the commissioners by Laceyville Borough Council president Randy Brigham. Laceyville has a relatively new council with younger members than some municipalities, and Henry was impressed by Brigham’s interest in bringing alternative resources to the borough for priority projects. “It’s so nice to see a borough council that wants to be involved with its town,” Mead concurred. In other news, the commissioners reappointed Dave Wilson to the Luzerne-Wyoming Counties Mental Health/Developmental Services board, noting that he has served as chairman of the board for the past seven years and brings more than 30 years of experience in social services to the agency. Rev. Lou Divis was approved as a welcome new member of the Luzerne-Wyoming Counties Drug and Alcohol board and cited for her diligence to the opioid crisis and emergency management services in Wyoming County. News reporter C.J. 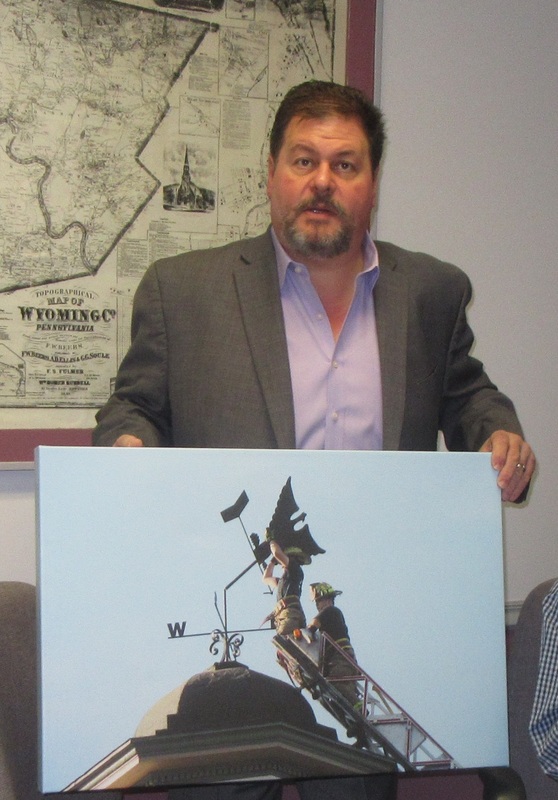 Marshall was thanked for his donation of a large print of a photo (below) that he snapped several years ago of Meshoppen firefighters replacing the weather vane on the courthouse roof after a wind storm.